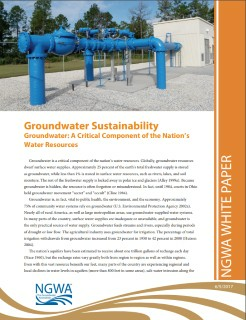 Description This white paper goes over the importance of groundwater sustainability, and how it is vital to public health, the environment, and the economy. It goes over factors that contribute to groundwater shortages, such as population growth and distribution patterns, and provides information on contamination and the effort to protect aquatic ecosystems. Other sections discuss recharge, current infrastructure design, methods available to promote sustainability, aquifers as reservoirs, and more. Finally, it concludes by going over tools needed to implement strategies in the future, data gaps, priority areas, and the importance of collaboration between decision-makers.